The 1920s gets a lot of love, even today, decades later. We see the 1920s in shows like Boardwalk Empire, in Halloween flapper costumes, in artwork, fashion, books, movies, etc. We love bootleggers, speakeasies, dancing the Charleston, fringe dresses, rolled stockings, Cloche hats, and saying things like "the bee's knees", "and how" and "the cat's meow". We will love the '20s even when we reach the 2020s (boy won't that be confusing). So when did this nostalgia for the 1920s begin? I imagine it started even before the 1920s were over. The Stock Market Crish of October 1929 put an end to the carefree culture of the 1920s. Ten years later, Raoul Walsh would direct a nostalgia picture that reminisced about the old days of bootlegging and gangsters. It would also serve as a big send off for James Cagney, who had been playing gangsters for years and was ready to move on. Cagney plays Eddie Bartlett, a World War I soldier who comes home from France to find a very different America, a land without opportunity, waiting for him. Bartlett is a victim of his circumstances. He's a good guy trying to stay straight in a world that won't let him. He first becomes a bootlegger and then runs a night club. It's Prohibition and the party-loving culture of the 1920s that makes Bartlett successful. And while he still longs for the innocence of his past and sees that in soft, doe-eyed Jean (Priscilla Lane) he's is in too deep in his racket. He takes on fellow soldier George (Humphrey Bogart) who is still blood-thirsty even years after World War I ended. 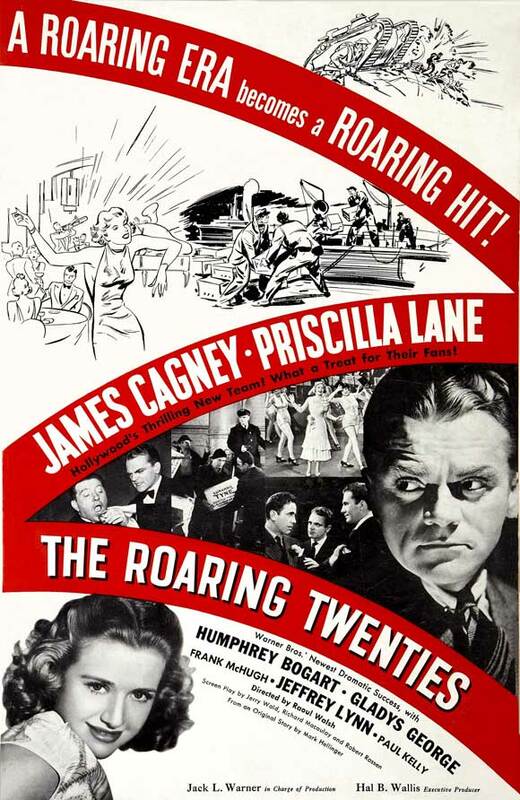 Although this is Cagney's movie, Bogie plays a significant part and this is considered one of his last supporting roles. This film comes at an important time. America has been in the grips of the Great Depression for nearly a decade and World War II had just begun. It's a scary time and perhaps looking back at the previous decade gave people hope that America could once again be a land of opportunity and place to pursue happiness. as you might imagine i LOOOOOVE this film! i have ever since i was old enough to comprehend the english language, lol! i agree with you, Bogie's role was pivotal and he brought a palpable feeling of how dangerous and unhinged that guy was without ever going overboard, you could just hear it in his voice how much he loved doing what he did. But yeah its Cagney's film and man he is so awesome in this i cant put it in words! he certainly brought his usual intensity and energy but also that touch of pathos that made him sympathetic. it was an interesting contrast between Cagney and Bogie's characters, one did what he did because it seemed like he couldnt do anything else, while the other wouldnt dream of doing anything else! ultimately their way of life would be the downfall of them both. Walsh's fast-paced direction and the production design really gives a feeling for the excesses of that era, it really only slows down during the scenes with Jeff Lynn and Priscilla Lane. When one looks at Walsh's body of work, it is really quite staggering how many great movies he directed! great post Quelle, you sure have been watching some amazing flms lately! i'm so stoked for Metropolis later on!!!!!! I think one of the reasons the Twenties remains one of people's favourite decades is that it was so interesting. A lot was happening in art, music, architecture, and society. It even had a counterculture. In this respect I think The Roaring Twenties is more influential than it is given credit. I think that this film is a lot of what fuelled the Twenties nostalgia. It is what gave birth to such shows nearly twenty years later as The Untouchables, The Roaring Twenties, and so on. After all, it has nearly everything that makes us think of the Twenties: gangsters, flappers, speakeasies... It is one of those films that is archetypal in its genre. Of course, the reason I think it has been influential is quite simply it is a fun movie. 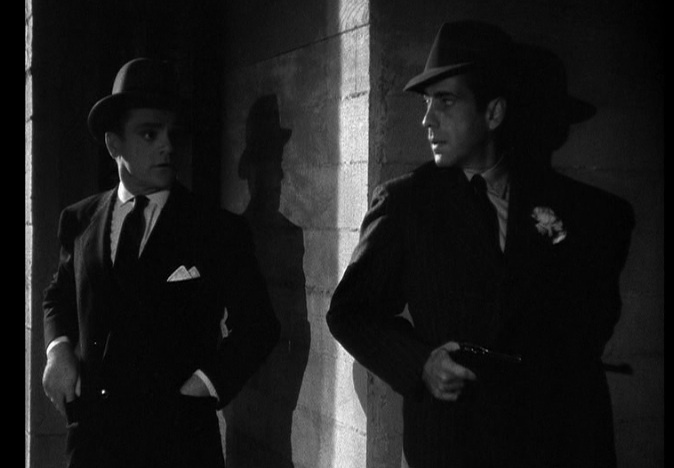 Cagney and Bogie are great in this film--I think this is my favourite film in which they both appeared. And the film has some real depth, giving us two different characters and how they react to the world evolving around them. This movie is the reason I can't stand Priscilla Lane in anything. 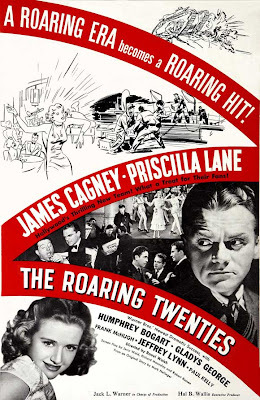 Saw this movie many times as a kid, and loathed the way Priscilla Lane treated Jimmy Cagney. Now, any time I see her...in ANY FILM...I recall this movie, how she dumped Cagney for some cardboard stiff, and I cringe. Cannot stand her. All thanks to a very effective film called "The Roaring Twenties." Paulie - You really don't like Jeffrey Lynn huh? I like the innocent characters in juxtaposition of the tougher characters. It makes the tougher characters tougher. Oh, I can't wait to read your thoughts about Metropolis! Mercurie - You are so right on. There is so much to love about the 1920s that we still love the decade to this day. Since it was sandwiched in between two world wars it was really a crazy time of excess and fun. Tom - Oh man. Good thing I watched Priscilla Lane first in Arsenic in Old Lace because she's just so loveable in that film. I felt bad for her character because she felt for Cagney but didn't love him. And also, have you see Love Me or Leave Me with James Cagney and Doris Day? He is so controlling in that it might make you forgive Priscilla Lane because at least she didn't stay with a psycho like him (oh man I'm mixing my movies now). the supporting player i really love in Roaring 20's (other than Bogie of course) is Frank McHugh, but then i love Frank in pretty much everything i've ever seen him in, lol! i'm gonna try to do a lil review of metropolis over the next couple of days. i need pics though! maybe some screen caps? hmmmmmm, meditate on this i will.